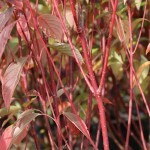 An upright, rounded shrub with red stems in the winter. 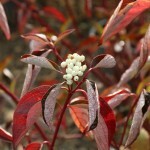 White flowers in late spring are followed by bluish-white berries. The foliage is medium green during the summer. The fall color is reddish-purple. It is tolerant of a wide range of soils. Removing some of the oldest stems will generate new, fresh, brighter stems. 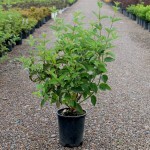 Great in mass planting or for an informal hedge.